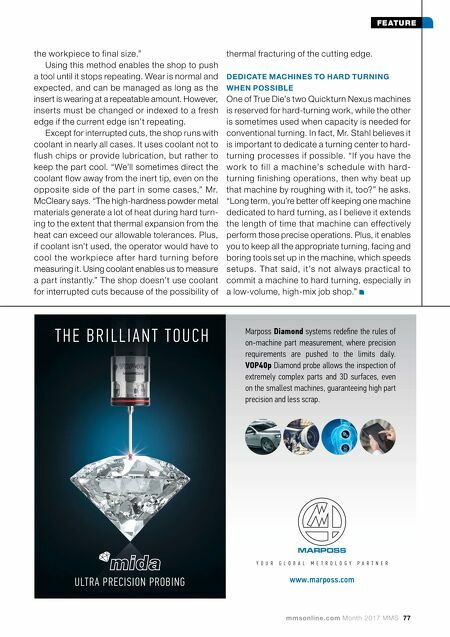 76 MMS October 2017 mmsonline.com FEATURE workpiece L:D, cutting conditions and so on. The shop might run as low as 150 sfm for heavily interrupted cuts in very hard materials to as high as 550 sfm in milder materials with a modest hardness rating. 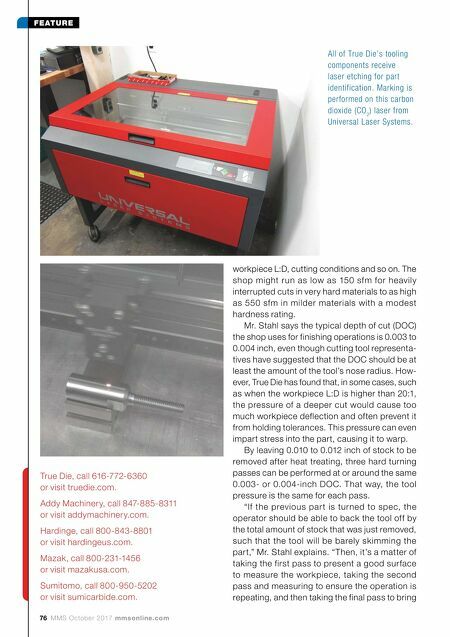 Mr. Stahl says the typical depth of cut (DOC) the shop uses for finishing operations is 0.003 to 0.004 inch, even though cutting tool representa- tives have suggested that the DOC should be at least the amount of the tool's nose radius. How- ever, True Die has found that, in some cases, such as when the workpiece L:D is higher than 20:1, the pressure of a deeper cut would cause too much workpiece deflection and often prevent it from holding tolerances. This pressure can even impart stress into the part, causing it to warp. By leaving 0.010 to 0.012 inch of stock to be removed after heat treating, three hard turning passes can be performed at or around the same 0.003- or 0.004-inch DOC. That way, the tool pressure is the same for each pass. "If the previous par t is turned to spec, the operator should be able to back the tool off by the total amount of stock that was just removed, such that the tool will be barely skimming the part," Mr. Stahl explains. "Then, it's a matter of taking the first pass to present a good surface to measure the workpiece, taking the second pass and measuring to ensure the operation is repeating, and then taking the final pass to bring All of True Die's tooling components receive laser etching for part identification. Marking is performed on this carbon dioxide (CO 2 ) laser from Universal Laser Systems. True Die, call 616-772-6360 or visit truedie.com. Addy Machinery, call 847-885-8311 or visit addymachinery.com. Hardinge, call 800-843-8801 or visit hardingeus.com. Mazak, call 800-231-1456 or visit mazakusa.com. Sumitomo, call 800-950-5202 or visit sumicarbide.com.